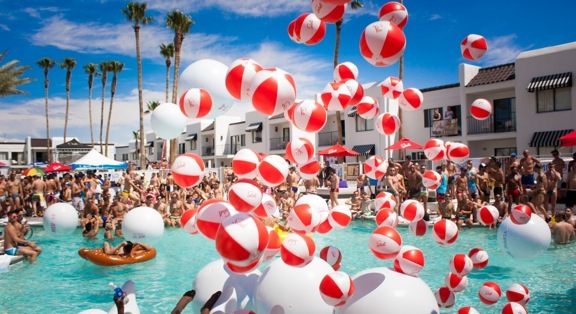 MATINÉE LAS VEGAS FESTIVAL, the fastest growing gay dance festival in the country, celebrates its 5th Anniversary in Las Vegas this Memorial Day with its hottest and wettest outdoor event ever. This year’s weekend will take place Friday, May 22nd thru Monday, May 25th. It will feature eight spectacular events over four days, with blazing pyrotechnics and top-of-the-line production, all headlined by the world’s leading DJs. For the first time, the Saturday night main event will be held at Cowabunga Bay, America’s newest waterpark featuring fifteen state-of-the-art water slides. Thousands of clubbers from around the world are expected to attend the fifth anniversary celebration of MATINÉE LAS VEGAS FESTIVAL. MATINEE LAS VEGAS FESTIVAL 2015 – WaterPark Teaser Video – MLV15 from MATINEE NYC on Vimeo. Matinée launched nearly twenty years ago in Ibiza. Their first US event was Pride in New York where they transformed Manhattan’s Governor’s Island into an extravagant dance arena, with explosive music and thrilling light shows. At sunset, a surprise fireworks display ignited the skyline. Matinée made its Las Vegas debut in 2010 with MATINÉE LAS VEGAS FESTIVAL. It included jaw-dropping spectacles, including one that involved synchronized swimmers performing in a glass pool of water set on fire. The evening capped with a surprise performance by pop singer Natasha Bedingfield. This year’s MATINÉE LAS VEGAS FESTIVAL will be their biggest yet. The Saturday night main event at Cowabunga Bay waterpark with feature beats by DJ Hector Fonseca and Matinée Spain all-star DJ Taito Tikaro, as well as a special surprise performance. Sunday night’s main event, “La Leche!” will take place at Rain Nightclub in the Palms Hotel. Isaac Escalante and Lydia Sanz will provide the beats, along with a special opening by the winner of an “America’s Next Top DJ” search currently taking place on Facebook. The weekend will feature eight events over four days and nights, including main events and after-hour parties at the city’s hottest clubs, as well as pool parties at the weekend’s host hotel, Rumor. Each party will feature original themes designed to take revelers on a weekend-long journey. The DJ line-up includes some of the world’s most innovative icons in dance music from across the globe including Kitty Glitter, Dan Slater, Phil Romano, Tiago Vibe, O’Halley Brothers, Josh Whitaker, DJ Grind, Kidd Madonny, Billy Lace, and DJ Nando. Weekend passes start at $199. The exclusive and luxurious Rumor Hotel (455 East Harmon Avenue, Las Vegas) is the host hotel for MATINÉE LAS VEGAS FESTIVAL. Suites are sold out, however there is still availability across the street at Hard Rock and at the Tropicana with special Matinée rates starting at $199. There will be complimentary shuttle service from Rumor to all Main events.